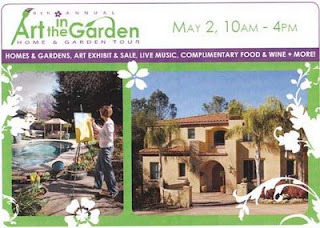 Next up Saturday May 2, 10am to 4pm ~ a fun day touring elegant homes and beautiful gardens! This is a benefit for Roseville Arts and Blue Line Gallery www.rosevillearts.org Tickets are $35. per person and we will be at the fifth house with our outdoor fountains, birdbaths, and other surprises. We held a special event Collectors Evening April 23rd at the studio celebrating 30 years as Nicholson Blown Glass. 30% of sales went to our local Boys and Girls Club for art supplies. No more Grad Night decorations so I am joining the glass world again! 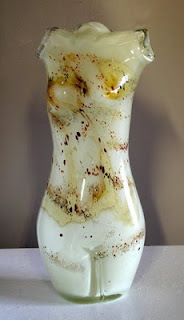 Rick created a freehand blown and hot sculpted Torso ~ his most difficult piece. The lighting at night was very dramatic and I was too busy to take photos! Oh well. We'll do it again. 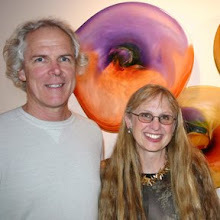 We had wonderful food, Fawnridge Wine, acoustical guitar and good comments from supportive people "We had a wonderful evening; beautiful glass, talent abounding, friendly people who also appreciate Rick's work, good food and drink. It was a perfect evening. Yes, plan another night and we'll be there." Hurrah taxes are done! Time to move on into Spring. 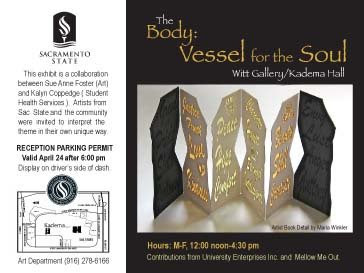 We are lucky enough to live near California State University Sacramento and our free hand blown and hot sculpted Torso, Earth, is a part of The Body: Vessel for the Soul show at the Witt Gallery. 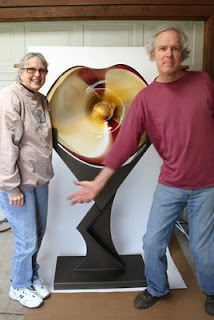 A fun reception will happen April 24 from 6 to 8. 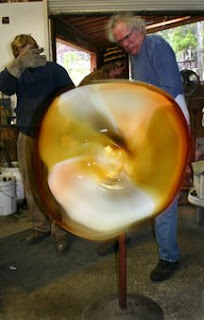 Rick has been working hard on these difficult forms.You can watch him make one on the video page of our website www.nicholsonblownglass.com . Second Saturday event at Patris S12 Gallery in Sacramento will feature internationally known Italian artist Father Bruno Segatta and his apprentice, Kurt Hausmann, a Sacramento native, exhibit their artworks portraying the city of Florence and landscapes of Tuscany. The revenues from Father Bruno’s works are used for his many charitable projects helping orphaned children in Kenya. 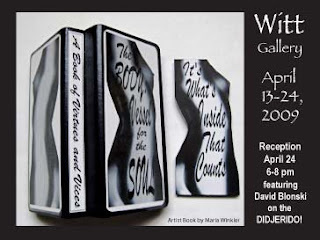 Opening reception 6 to 9. We will be participating along with 16 additional artists. 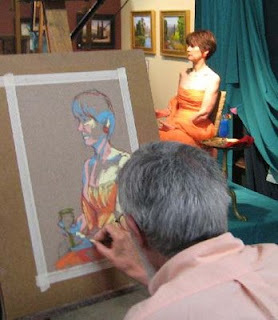 There is a live model painting session also and it is really fun to watch the artists work! I want to share with you the creation of the oversize UPLIFTS - steel and blown glass sculpture we recently created for the M Resort in Las Vegas. 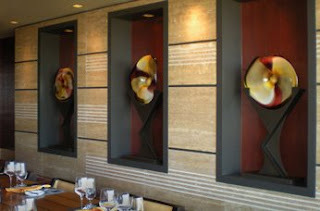 We also created two wall installations that appear to float! This is my first attempt to communicate by blog! 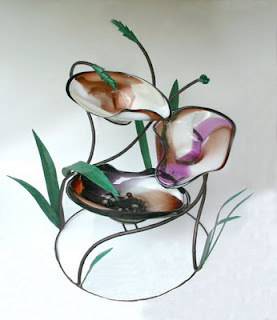 I plan to keep you updated with personal and professional events here at Nicholson Blown Glass. Hannah (our daughter) and I happened upon an incredible flower show at the DeYoung Museum in San Francisco when I picked her up from UC Santa Cruz for Spring Break. The photo reminds me of a glass chandelier.